Times are tough for zombie fans, who only have 999,999 forms of zombie fiction to spend their time with now that The Walking Dead has gone on its winter hiatus. 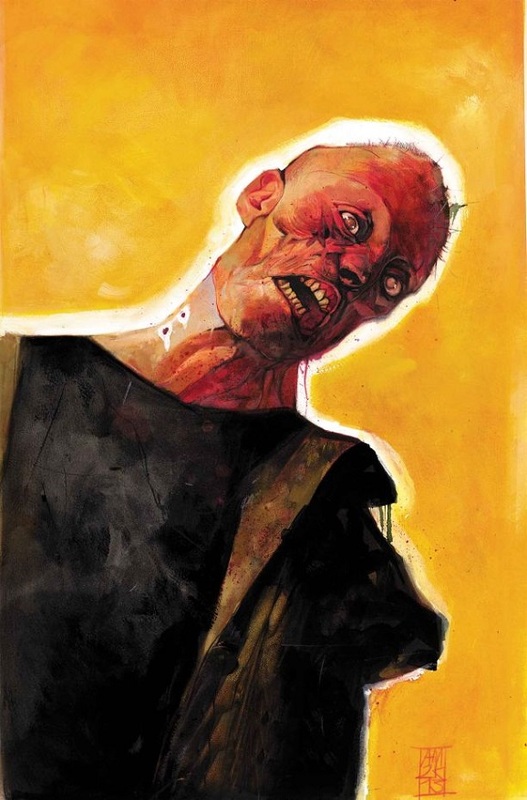 But zombies don’t quit for the winter, so everyone can safely look forward to the upcoming Marvel Comics series Empire of the Dead from genre king George Romero. 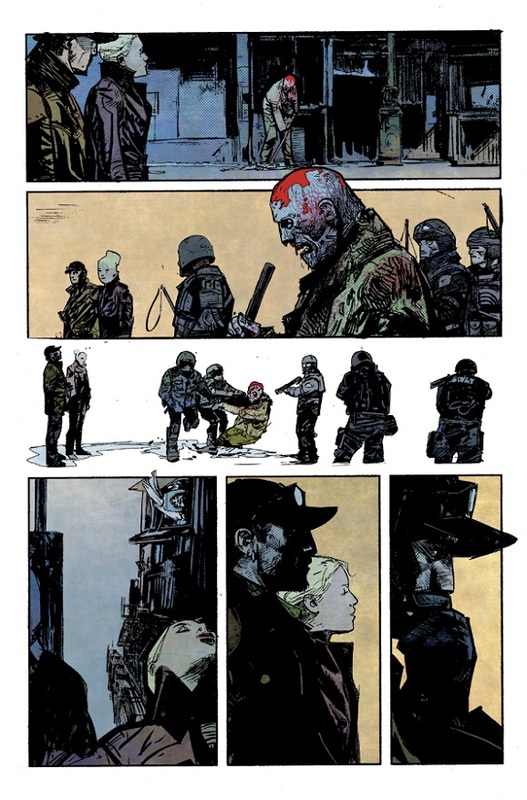 Though the comic will be out in a little over a month, they’ve already released a few of the presumably unfinished pages as a preview of things to come. And things are pretty gritty and dire, I warn you. The year is…I have no idea, but it takes place quite a while after a widespread zombie outbreak has passed. New York City is forever changed, and Manhattan has been quarantined with all the survivors. But they’re certainly not safe, as the undead threat isn’t the only thing putting them at risk. There are also vampires. I’m not happy about it either, but if I’m going to read anyone deliver a zombies vs. humans vs. vampires story, it might as well come from a legend in the game. So let’s take a look at the first four pages of the comic, which are all seen in dialogue-free mode, though I’m not sure if that’s because these are actually dialogue-free pages or if they just wanted to keep the early narration a secret. (The latter seems more likely.) 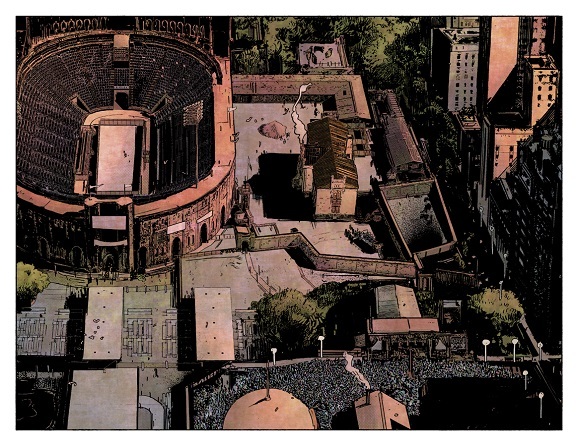 So enjoy the artwork of Alex Maleev, whose sense of shading and detail makes it look like modern and classic all at the same time. There isn’t a lot of concrete information to be found here. Random zombies appearing around normal people immediately get the beatdown from the military. A sports stadium appears to be part of the quarantine zone. We’ve got one particularly beastly-looking horror with a “Z” carved into his forehead and a savage look in his eyes; good thing he’s behind bars…for now! 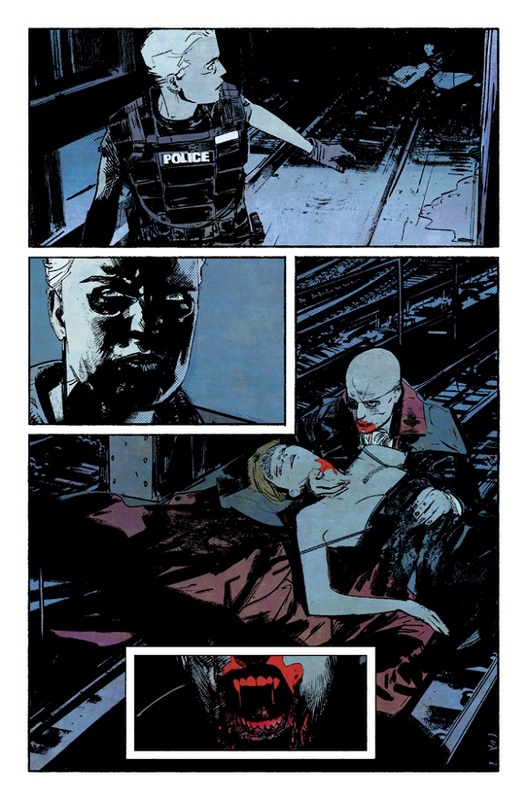 And then we and the cops are immediately introduced to the bloodsucking antagonists, as we see a vamp with an eyepatch taking a bite out of a woman’s neck. I like the muted red blood over the muted blue darkness. It’s just the kind of non-crisp look that some comics have gotten away from in recent years, opting for antiseptic images that lack personality. 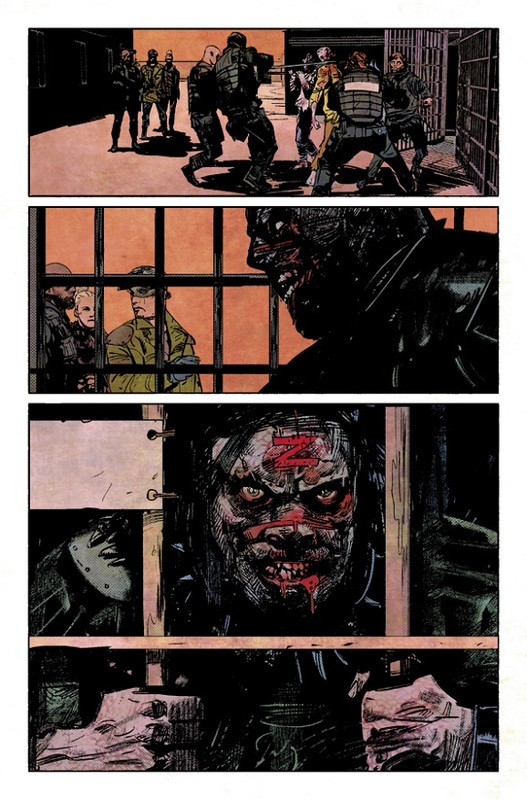 I guess we’ll see how much personality the zombie genre is capable of once the first of 15 Empire of the Dead issues hits stores on January 8, 2014. Are you guys excited about this or do you think it’ll be just your average zombie story?